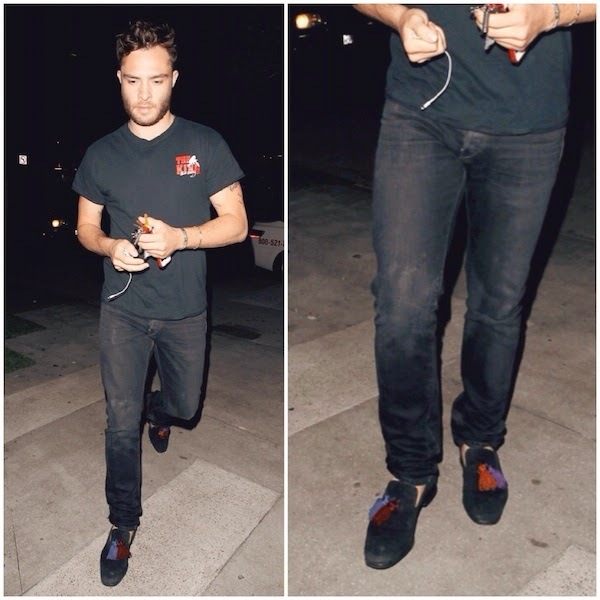 Ed Westwick was pictured outside BOA Steakhouse on 31st July 2014 in West Hollywood, California. The British actor wore a black t-shirt with matching fitted denims, and accessorised with a pair of Jimmy Choo 'Foxley' tasselled loafers. I really love Ed Westwick's whole look there. The simple t-shirt and denims were a practical choice to beat the summer heat, but I love the dressier loafers which elevated the look. Great grooming and seemingly effortless styling from Ed Westwick. Simple but so well executed.